What Kind of a Woman Was Dottie Hinson? If you haven’t seen the movie A League of Their Own, please go out, buy it and then come back and read this post. In the meantime, feel a lot of shame for yourself. For those of you who have seen it, the following debate may be all too familiar to you. I’ve had this argument with my buddies many times since college, and it’s always the same. I am adamantly on one side of the conversation and they are adamantly on the opposite side. We simply cannot agree, and we probably never will. At the end of the movie, when Kit Keller barrels into her sister Dottie at home plate while trying to score the winning run of the AAGPBL World Series… Does Dottie drop the ball on purpose to let her sister finally beat her at something? A little background information for those of you who haven’t seen the movie: It’s World War II and most of the male baseball players have gone off to fight the Nazis and the Japanese. Baseball owners, looking for a way to recoup the losses they are experiencing from not having baseball in their stadiums, create a baseball league for women. Although the characters in the movie are made up, the league really did exist, so this movie gets the old “based on true events” tag. Dottie Hinson (Geena Davis) and Kit Keller (Lori Petty) are two small town sisters who get invited to a national tryout in Chicago by a league scout (John Lovitz). Kit has basically lived in her older sister’s shadow all of her life, and things are no different once they both get signed to the Rockford Peaches. Dottie emerges as the face of the league (the female Lou Gehrig), while Kit is just known as “Dottie’s Kid Sister, Kit.” Everything comes to a head one day and, when Dottie realizes how much it hurts Kit to be in her shadow, she demands to be traded. The Peaches, of course, decide to trade Kit to the Racine Belles instead. Inevitably, Dottie and Kit’s teams face off in the World Series. This brings us back to the moment in question. In the last game of the series, Kit comes to the plate in the bottom of the 9th as the winning run. 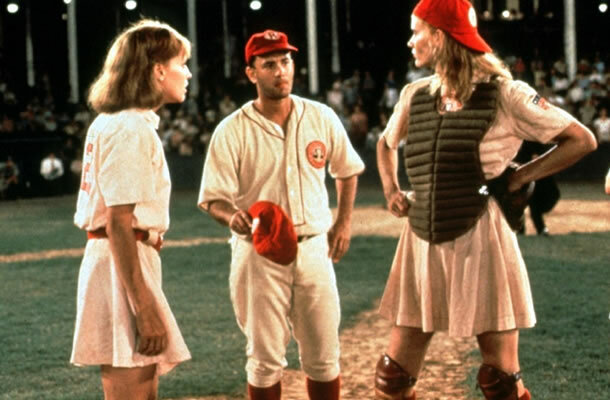 Dottie, who had just given the Peaches the lead in the top of the 9th with a crushing 2-run single off of Kit, tells the pitcher, Ellen Sue Gotlander (Freddie Simpson), to throw Kit high fastballs because she knows that’s the one pitch Kit can’t hit, but will always swing at. Kit is quickly down 0-2 after two high fastballs, but muscles up and crushes the third one over the center fielder’s head. The tying run scores ahead of Kit and the third base coach tells her to hold up at third with a triple. To the surprise of everyone, especially Dottie, Kit runs through the stop sign and right at Dottie. The relay throw comes home and Kit slams into Dottie at full strength just as she catches the ball. The two crumple to the ground and the ball comes free as Dottie’s hand hits the ground. Kit is called safe, and the Racine Belles win the World Series. As convincing as that seems, it’s impossible for me to think that Dottie drops this ball on purpose. First of all, along with being the most talented, Dottie is one of the most competitive players in the AAGPBL as well. She’s proud to be a baseball player. She likes being the best. She even embraces being the face of the league, making flashy plays (she does a split while catching a pop-up earlier in the movie). She even manages the team while Dugan spends the first half of the movie drunk in the dugout. When Dottie leaves the team in the wake of her sister’s trade, she comes back because she wants to win the World Series. She doesn’t want to let her team down by quitting on them. Why would she purposefully lose the World Series for them? As I stated earlier, Dottie crushes a single that almost takes Kit’s head off to give the Peaches a 2-1 lead in the top of the 9th. Why didn’t she just swing lazily and ground out? Sure she feels bad that her sister is devastated after the big hit, but that doesn’t stop her from sliding into the dugout to catch a pop-up for the 2nd out of the 9th. When Kit comes up to hit, Dottie tells Ellen Sue exactly how to get Kit out with high fastballs. She coldly says the words “can’t hit ’em, can’t lay off ’em” as she gives Ellen Sue the scouting report on her kid sister. When the throw comes in to home plate, Dottie catches it and braces herself perfectly for the hit. There’s no loosey goosey grip on the ball. She’s ready for contact. Kit simply hits her hard enough to jar the ball loose. There’s no doubt in my mind that Dottie is happy for her sister. Kit finally has her shining moment, she can escape Dottie’s shadow. Anyone would be happy to watch their sibling have a moment like that. I just don’t think Dottie would give Kit that moment for free. Kit earns that moment for herself. If Dottie drops the ball on purpose, then there’s no redemption for Kit. She’s still in Dottie’s shadow, and only wins because Dottie let her. That robs Kit of her moment, and it robs the viewer too. We secretly want Kit to have her moment too, just like Dottie does, but it only works if it’s legitimate. Whatever side of this argument you’re on, you have to admit one thing, and that’s that this is a solid sports movie. A rare hybrid between sports movie and chick flick that appeals to both men and women. I’d rank it up there as one of my favorite sports movies. The baseball action is very realistic, and Tom Hanks steals the show with his portrayal of Jimmy Duggan. Solid acting, solid sports action, and even a little emotion thrown in for the ladies. Go out and get this one today if you haven’t seen it. Judge for yourselves… On purpose or not? Also, a friend of mine pointed out the following: Dottie catches a hard throw from Doris with her bare hand earlier in the movie…. Dottie’s got some grip… but I still stand by my claim! This moment is clear evidence that she dropped the ball on purpose at the end! Though I must admit — that while I am firmly in the Dottie dropped it on purpose camp — this post did test my confidence in that. Either way, it’s a great movie with a spectacular end sequence. Dottie, although a pillar of strength to the other women, struggled with two very distinct issues during her time in the league. On one hand, she’s trying to preserve her family units. Dottie only went to tryouts on the condition her sister Kit was able to go. Later in the film, she tried to get traded so Kit wouldn’t have to compete with her. When her husband is wounded in war and returns home, she doesn’t force her him to a life on the road to serve her dreams. It just wouldn’t be right. In the end, it got too hard deciding between the two and she uses her husband’s return from war as a reason to quit the league, hence choosing her family over her dreams. Sure, she comes back to play in the World Series, but she didn’t make it her life. Dottie loved the game, but valued her husband and her sister more. She was in a no-win situation if she pursued her sports career. Her war-torn husband would be left alone at home and she was already losing her sister due to jealousy and bitterness. Is she the type of woman to make a mistake at the most key moment of her short-lived sports career? No, the “Queen of Diamonds” knew exactly what she was doing. Dropping the ball simultaneously made her wounded husband a priority and gave her sister’s wounded ego the confidence boost it needed to move on. Take off the 2011 sports goggles, Jobu, and put yourself in the cleats of a 1943 housewife earning double the salary she would be milking cows. Only then can you clearly see that Dottie Hinson was the type of woman to lose a baseball game in order to win her family back. thank you for pointing out that it’s Hinson and not Henson… apologies to my readers for not catching that snafu myself. I feel like this is as good an argument for “dottie drops it on purpose” as i’ve ever heard. Its thorough, complete and very well written. However, I cannot agree. If she wanted Kit to win, she had many opportunities to let her win. Why play in the series at all? Why get the big hit? Why tell Ellen Sue exactly how to get her sister out. If Kit doesn’t finally hit the un-hittable, un-lay-offable pitch, none of that ever happens. The only possibility is that it all hits her when Kit comes chugging around third. The fact that Kit ignores the third base coach’s stop sign shows Dottie just how badly she wants this win and, in a momentary lapse of competitive fury, Dottie does the right thing for her kid sister. Is that really how we as viewers want Kit to finally beat Dottie though? I think it takes a lot away from the experience if it’s just Dottie laying down for Kit. You definitely brought a whole new perspective on this issue. I’ve never thought of it from the 1940s woman point of view. We all know Dottie claimed she wanted to go home and have children, or at least make her husband happy. I don’t know if I ever really bought it though. She seemed more like she was trying to convince herself and not Dugan and her teammates. I don’t think she ever really sounded excited about it. Was that really her passion? Bill Pullman is pretty pumped up when Dottie hits the 2-run single in the top of the 9th, maybe he wouldn’t have minded being on the road. Don’t forget, he also brings her back to play in the World Series. Also, and I’m not sure about this, but did she mention anything about having kids when she’s older? Kit shows up with her kids, grandkids, etc. Dottie shows up alone. In the end, would it really have been worth possibly dropping the ball on purpose? If it helps, I have to re-watch the movie every once in a while just to make sure I still think it’s not on purpose. Next time I watch it, I’ll definitely keep your excellent points in mind. Who knows? maybe when Kit comes chugging around third, i’ll realize that both Dottie and I have changed our minds… and then again, maybe i’ll give Kit credit where credit is due. Maybe Dottie got rattled when she saw Kit charging her from 90 feet away, and maybe that caused her to drop the ball. I wonder if the filmmakers have this argument to, or if they know the actual truth? Some could use this as evidence for a pro dropping it on purpose argument. To me, she just wants to make sure the kid gets a chance to shoot. He’s gotta make it on his own… like Kit did when she jarred the ball from Dottie’s grip? 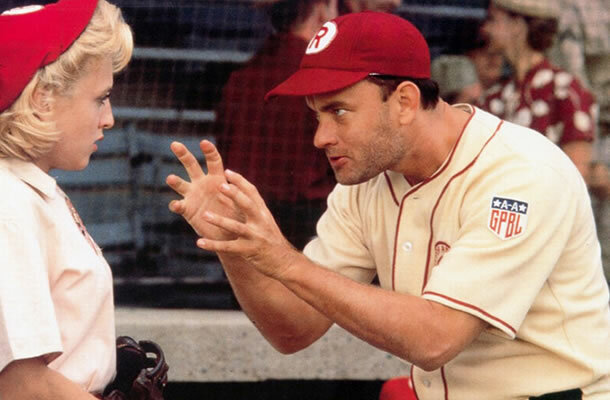 Jobu and CT both presented cogent theses in their analysis of Dottie Hinson in Penny Marshall’s seminal feature “A League of Their Own.” I like CT’s better. Dottie Hinson, “the Queen of Diamonds”, was a physical specimen: bigger, faster, stronger than anyone in the league. Like Shaq or Bo Jackson in their prime. The newsreel about the AAGPBL in the film stated “Then there’s pretty Dottie Hinson, who plays like Gehrig, and looks like Garbo.” The play by play announcer described her as “Big Dottie Hinson striding to the plate.” By physics alone Dottie would have stoned Kit at the plate. Dottie is 6’0 I would say 160 while Kit is 5’6 110 soaking wet. Earlier in the film Dottie had a similar collision at home plate. A girl bigger than Kit tried to blow up Dottie home plate but she protected the ball in her glove and presented it to the umpire for the out… textbook catcher technique in blocking the plate. In every other baseball scene in the film Dottie played with a Borjon Borg demeanor. To quote Rob Base she was “cool, calm, like a breeze.” Watching the clip above Dottie had plenty of time to brace for impact and keep the mitt close to her body. But as Kit barrels down the third baseline she had an uneasy or even panicked look on her face. In that moment she decided to let her sister beat her. Dottie is an ultra-competitor and a loyal teammate, that’s why she came back in game 7. But like CT said she is also a woman who values her family above anything else. Knowing that it was her last game, Dottie dropped the ball to end her career in baseball and in turn passed the torch to her little… or should I say younger sister. I really do love this topic. My college roommates and I argued about it for four years, i’m still not satisfied either way, and every time i see the movie i find something else to support both arguments. I think that’s the sign of a good sports movie. hell, that’s the sign of a good movie in general, right? We’re still talking about it and it’s damn near 20 years later! For those of you wondering, July 1st, 1992 is when it was released, according to imdb. I hope they do something for the 20th anniversary next summer. I still think she would want Kit to earn her big win, and that seeing Kit chug around third like she did rattled Dottie enough to get her out of position, which caused her to drop the ball. I tend to agree with the Jobu interpretation. Even the greatest players get beaten, otherwise it wouldn’t be a game and all results may as well be phoned in. I just found this because I was looking for an answer: Do we know who Rockford acquired in the Kit Keller trade with the Racine Belles? That’s a great question. I don’t believe we ever saw a new player join the team after Kit was traded. Maybe the did the old Player to be Named trade. Perhaps they traded Kit for cash considerations too. They were under the gun to get rid of her, so perhaps they didn’t finalize the return for Kit until later in the season or off-season. Thanks for the quick reply. I checked the rosters and there were two names on the end credits which did not appear in the handwritten lists early in the movie (the Four teams and the cut lists). These other two names were “Mumbles” Brockman (OF) and Vivian Ernst (2B), but I don’t think either of these were trades since I could not discern those names on the out-of-focus Racine Belles handwritten roster list (they were probably important stand-ins that could play baseball). Vivian Ernst may have been a replacement for Marla Hooch, though. 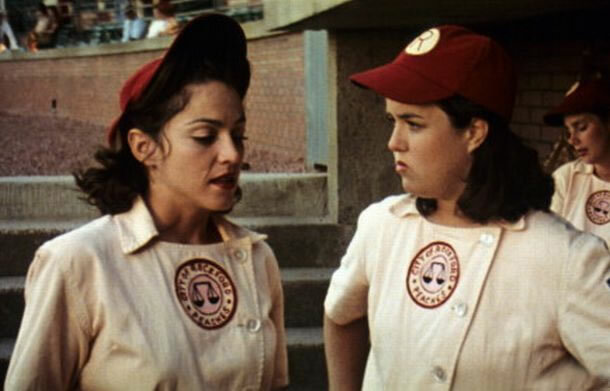 So, I think you’re right, no player went to the Rockford Peaches in the Kit Keller trade, and in fact, when they started the “World Series” the players lined-up in a “V”, and there was one yellow jersey (Racine Belle) lined-up with the remaining Peaches, suggesting 17 Belles and 15 Peaches. Incidentally, there are actually two handwritten rosters for the Rockford Peaches — I’m not sure if any fan caught that — but the first list shows “Dorthy Hinson, Shirley Baker, Linda Babbitt, and Elizabeth Dalton” and the second list appears when Helen Haley shows Shirley Baker her name. It goes “Dorothy Hinson, Linda Babbitt, Shirley Baker and Elizabeth Dalton.” I suspect they switched the list due to the spelling error of “Dorothy,” but they also switched the order of Linda Babbitt and Shirley Baker. I also gave more thought to your question. It comes out the same. Dorothy Vinson was a straight arrow, she would not throw a game to make her sister feel better. I’m the youngest. Growing up, I never had my siblings let me win anything, and I don’t think they would let me win now that I’m an adult. Kit and Dottie were adults, both trying to win the big one. I just don’t believe it was on purpose. It’s funny. I like to watch the movie every couple of years because i start believing the whole “on purpose” argument, or at least seeing the evidence. Also, I love that the movie sparks this argument, so I hope none of the people involved in writing or making the movie ever answer the question for real. Thanks for the comment, and keep reading!